At the heart of the show, however, was The Leak in Your Home Town (2010), by artist-programmers Mark Skwarek and Joseph Hocking, who, to create their work, used augmented-reality software, a method for superimposing 3-D images over live video feed. When visitors pointed an iPhone at a British Petroleum logo installed on the floor, the viewscreen ignited with the image of a swirling toxic oil plume in Flash animation, which leapt out of the corporation’s once benign-looking green-and-yellow sunburst. Leak, it should be noted, will work on any BP logo, anywhere, and at press time Skwarek and Hocking were deciding whether to make the smartphone application that runs it available to the general public for “next-to-free.” Let’s hope they do just that. Leak is a one-liner, but it’s a good one—a work of interventionist art so deliciously acerbic it deserves the broadest audience possible. 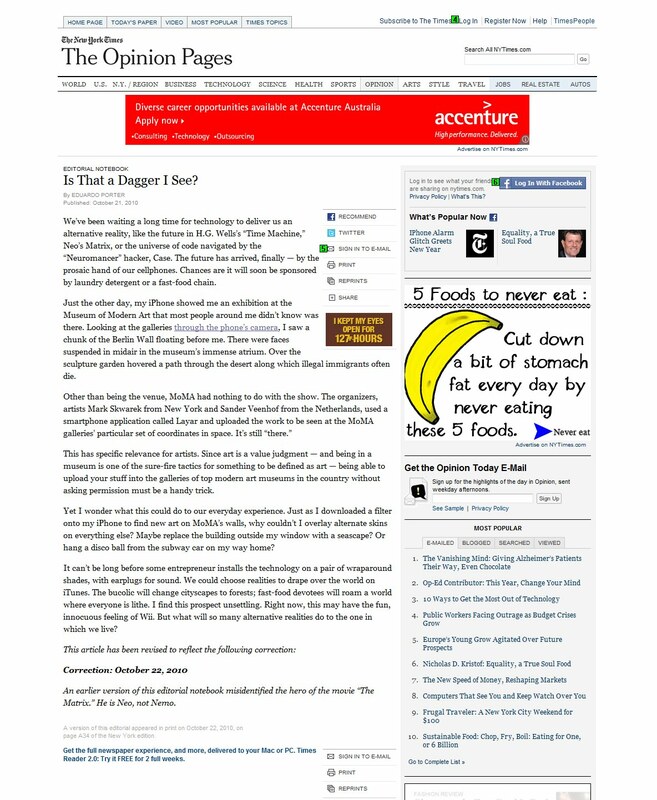 New York Times ::: Is That a Dagger I See on My iPhone? An illustration promoting a smartphone application being developed by the Stedelijk Museum in Amsterdam. The Amsterdam museum is not alone in its use of smartphones. Within the next year, many of the top museums in the world — especially contemporary ones — will introduce applications for smartphones, if they have not done so already. The Museum of Modern Art in New York and the Los Angeles County Museum of Art offered smartphone applications this summer, and European museums are following suit. Think of it as a 21st-century update on the audio guide, that staple of museum education departments. By next spring, the Stedelijk will allow people to interact with exhibitions on smartphones while at their home or in the museum. Although the Centre Pompidou in Paris has no anticipated starting date, it is six months into the production of a smartphone application and already sells exhibition guides to be used with smartphones. The Reina Sofía Museum in Madrid and the Hamburger Bahnhof in Berlin are expecting Web sites or applications designed for mobile technology in the next two years. The Museum of Modern Art’s application is one of the most popular. Since its iPhone application was introduced in August, it has been downloaded more than 400,000 times, according to Allegra Burnette, the museum’s creative director of digital media. Drawing on earlier applications like those from the Museum of London and the Brooklyn Museum, MoMA’s application offers a selection of audio tours with images and videos and access to one-fifth of the museum’s collection. MoMA also started offering a Web site for mobile phones last month. MoMA’s effective use of audio, video and slide shows on its smartphone application is likely to keep drawing new users, but the future of museum applications lies in how these features are combined. The Stedelijk is taking a gamble, putting audio and video features on an “augmented reality” Web browser on the smartphone. 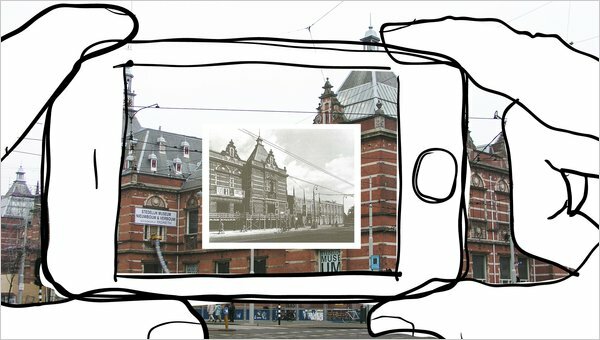 Stedelijk is using Layar, an application that lays three-dimensional objects over the smartphone’s screen when the phone’s camera is pointed at real rooms and buildings. The Stedelijk used the Layar application at the Lowlands music festival in the Netherlands in August and in September at Picnic, a yearly conference in Amsterdam on art, science, technology and business. At Stedelijk stations set up at the events, visitors thumbed through collections showing the museum’s works. The works included bar codes that people could scan using a separate application. They then received a digital version of each work. Using Layar, they could “hang” the work on a geographic coordinate within the grounds of the festival. When other Layar users pointed their phones at the coordinate, they could also see the hung work. The Museum of Modern Art was the site of another Layar exhibition. 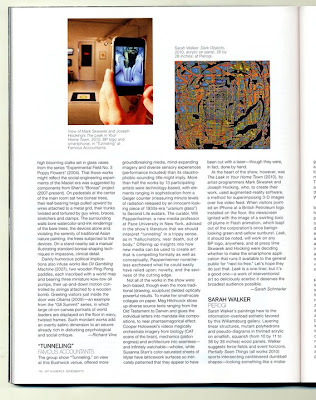 The Conflux Festival in New York held a show in October, using Layar on smartphones to display art in the museum’s galleries without first asking the museum. Participation is important for the new generation of applications coming from these museums. The Stedelijk, for example, intends to ask a lot of the user. “We want to make an A.R. project with strong emphasis on user-generated content,” Mr. Wils said, referring to augmented reality. He also emphasized the importance of getting artists involved in the process. “We want to see that artists are using the technology to come up with new user experiences,” he said. The Los Angeles County Museum of Art started offering an application last summer, called “In Still Life 2001-2010,” that required user participation. “I myself would call it an interactive participatory work of art, but it’s up for interpretation,” said Amy Heibel, the museum’s director of Web and digital media, referring to the application that lets people rearrange 38 elements of a 17th-century Dutch still life. This application, produced by the technology companies For Your Art and Ovation, yields results in the style of the contemporary conceptual artist John Baldessari. Its introduction coincided with the June exhibition of Mr. Baldessari’s work at the Los Angeles museum. The general smartphone application for the museum is expected to be introduced by the end of this month. Through an icon that appears on the smartphone’s screen, the phone’s browser will be connected to the museum’s mobile Web site, where users can see 175 works from the permanent collection, with supporting text, video and audio from the curatorial department. In Madrid, the Reina Sofía is taking a different track. Chema González, the head of cultural activities, says the museum is focusing on audio programming, in an effort keep visitors’ eyes on the artworks while enriching their experience. It plans to have four audio podcast channels from which people can download programming onto smartphones and use at home or in the gallery. Beginning this month, two channels will have programming by exhibiting artists and curators. Another channel will draw programming from the museum’s 1970s collective conceptual art, and the last channel will be left for more conceptual programming by artists. Most museums’ smartphone application projects have a similar approach to development, through contracting with outside companies or experts in the digital arts sector. The museums all offer information and gather feedback on social networking and media sites, and almost all the products are free. The Centre Pompidou sells smartphone audio guides to special exhibitions, and the Stedelijk is considering offering premium smartphone editions. But for the most part, all of these new experiences cost nothing but the time it takes to download them. WNYC says BUSHWICK AR INTERVENTION is a must see! Loading: A new definition of art? in "the next great generation"
Loading: A new definition of art? Are We Entering the Age of Augmented Trademark Infringement? The use of logos or insignias to symbolize a product, service or company is one of the oldest ways for a brand to stand out from competitors and similar products. These days, laws protect the misuse or copying of trademarked brand logos, but as technology evolves and companies find new ways to market their brands, these laws must adapt to cover new possibilities for infringement. Augmented reality is a popular technology for new media advertising, allowing images, logos and markers to become triggers for 3D experiences on computers and mobile devices. It also could create 21st century legal dilemmas. Who has the right to create AR experiences from trademarked brand logos? Is the age of “augmented reality trademark infringement” rapidly approaching? “This repurposing of corporate icons will offer future artists and activists a powerful means of expression which will be easily accessible to the masses and at the same time will be safe and nondestructive,” they say. Nondestructive in what sense? Yes, virtually spilling oil is safe for the planet, but the use of BP’s own logo is destructive to their brand and the company has the right to protect it. It is true that BP’s brand has already been irrevocably damaged due to the spill, and it is also true that augmented reality is a niche technology not likely to be a strong vehicle for further brand damage (yet), but BP still has the right to control how its logo is used. Would BP actually benefit from defending their trademark in this way? Erik J. Heels, a trademark lawyer with the Clock Tower Law Group in Maynard, Massachusetts, says BP would be better off simply letting it go. Trademark law, Heels says, was created to protect similar products and services from being confused with one another, and it is unlikely a person using this app would be unsure of whether it was or wasn’t officially endorsed by BP. Free speech, parody and commentary are other areas of law that overlap with this issue, which makes any action from BP even more unlikely. If any entity is going to challenge the existence of the application, it is likely to be Apple, which has had no problem keeping any app they deemed questionable from passing inspection. It is unlikely that this application will get by Apple in its current state, but an updated version using a different logo most certainly would. In the future, however, if augmented reality takes off and is part of our everyday lives, an application like this could attract more legal attention from a popular brand. Should brands have the same protections over the use of their logos in augmented reality (or specifically as the marker to launch an AR experience) as they do in actual reality? Who has the right to use trademarks as AR triggers? These are questions brands will be faced with as AR continues to expand its presence in digital marketing. In an interview with UgoTrade author Tish Shute, AR developer Anselm Hook discussed what he calls the “imageDNS” – a name space for images – which could potentially be used to solve some of these issues. There’s a new form of trademark infringement on the horizon. For the past few years, brand owners have been scratching their heads over what to do when third parties use their trademarks in online games and virtual worlds. The merging of parody, free speech and trademark infringement has led brands into some murky waters. Now programmers have come up with a new way to play with brand value: augmented reality. It is an innovation that connects the real world with the virtual world: for example, physical branded products can be augmented in real-time with digital images. Point your camera phone at the logo on a BP service station and the screen displays the now infamous Helios with a gushing oil pipe bursting from its centre. 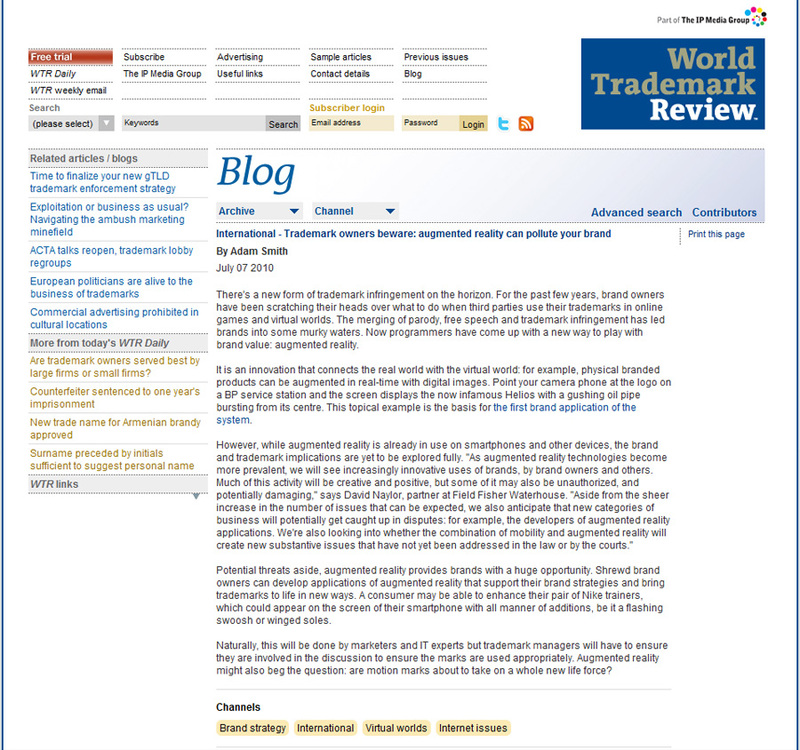 This topical example is the basis for the first brand application of the system. Potential threats aside, augmented reality provides brands with a huge opportunity. Shrewd brand owners can develop applications of augmented reality that support their brand strategies and bring trademarks to life in new ways. A consumer may be able to enhance their pair of Nike trainers, which could appear on the screen of their smartphone with all manner of additions, be it a flashing swoosh or winged soles. Naturally, this will be done by marketers and IT experts but trademark managers will have to ensure they are involved in the discussion to ensure the marks are used appropriately. Augmented reality might also beg the question: are motion marks about to take on a whole new life force? The story Bruce Sterling posted up last week on his Wired blog blew my mind. It shouldn’t have really. But I guess I’ve been considering augmented reality and its commercial uses to be official and sanctioned. This kind of unofficial gonzo-view of reality could go a long way. 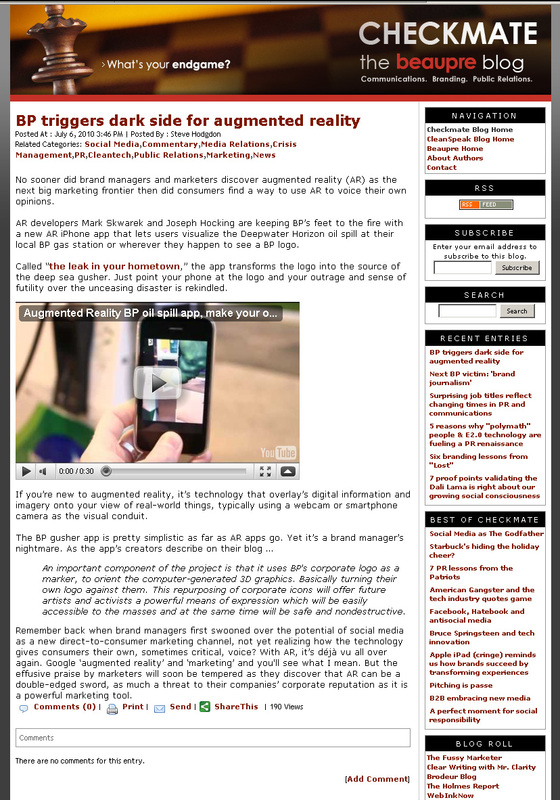 First, if you’re too lazy to click the link and check out the article, the leak in your hometown gang have made an augmented reality view that shows the oil leak on your smartphone when you point it at any BP logo, assuming you have the proper layer pulled up. 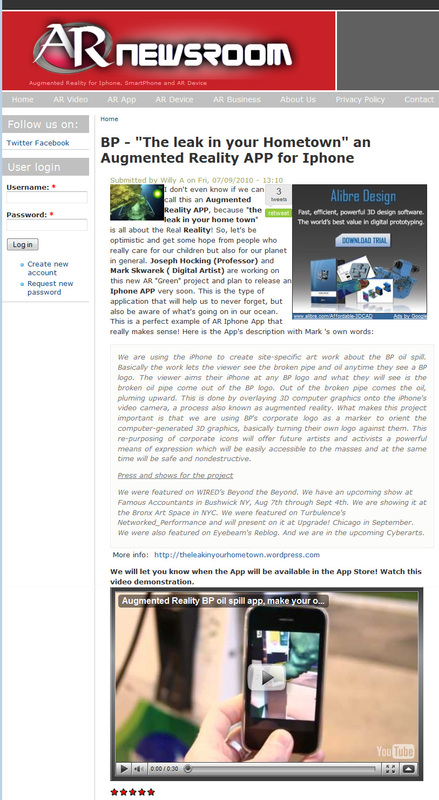 Mark Skwarek, one of the creators, sent me an email about the project as I was writing up this post. Here’s some of the progress they’ve made and other places talking about it. 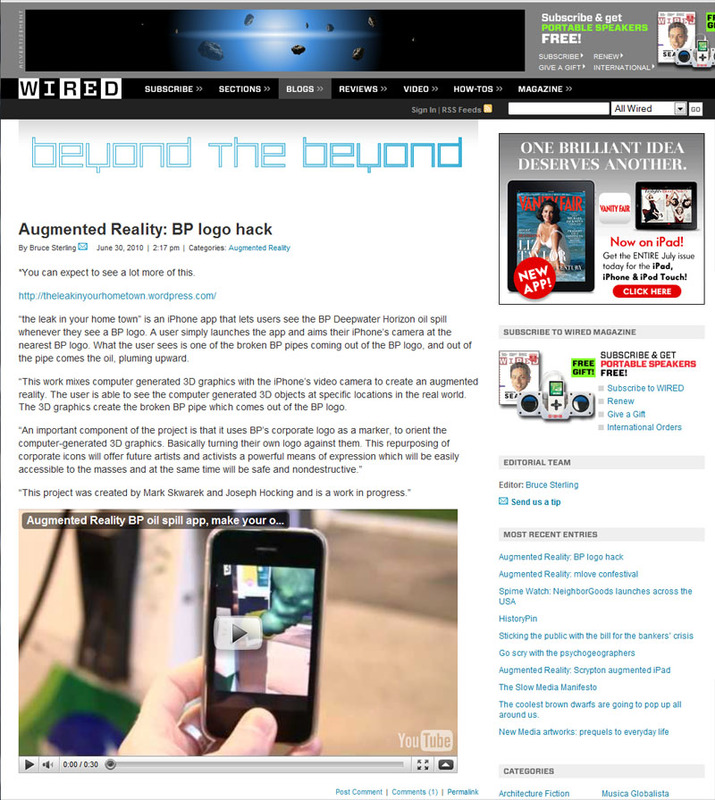 We were featured on WIRED’s Beyond the Beyond. We have an upcoming show at Famous Accountants in Bushwick NY, Aug 7th through Sept 4th. We are showing it at the Bronx Art Space in NYC. 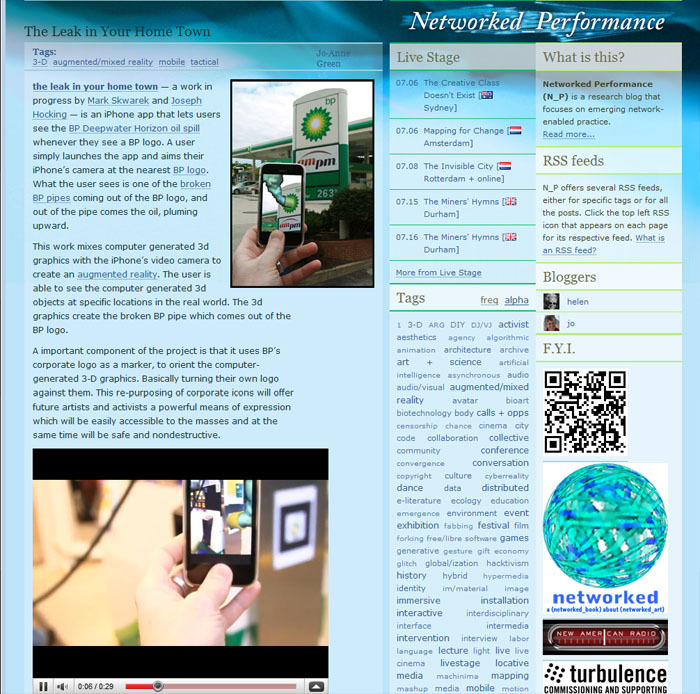 We were featured on Turbulence’s Networked_Performance and will present on it at Upgrade! Chicago in September. We were also featured on Eyebeam’s Reblog. 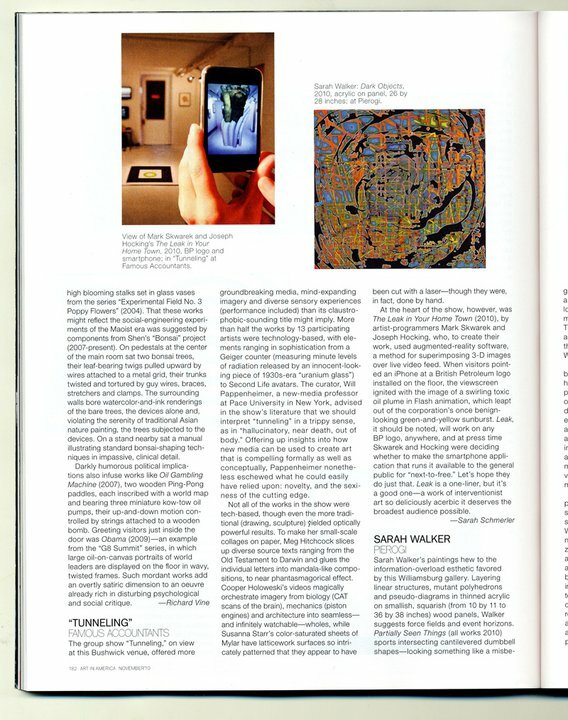 And we are in the upcoming Cyberarts. This project itself seems simple and is quite ingenious. But why stop at poking fun at the world’s current kick toy? Pointing your smartphone at random objects and getting an individual person’s POV visual could be quite mind expanding. I’m absolutely certain I wouldn’t want to see what Lady Gaga has in mind for the world. Well. I might take a peak for a few minutes. Just out of curiosity. Not like I’m a fan or anything. Just curious. It’s a nice little project, anyway. Famous Accountants just voted Best New Brooklyn Gallery! Mark Skwarek and Joseph Hocking mentioned in BushwickBK.com review for the Famous Accountants show. 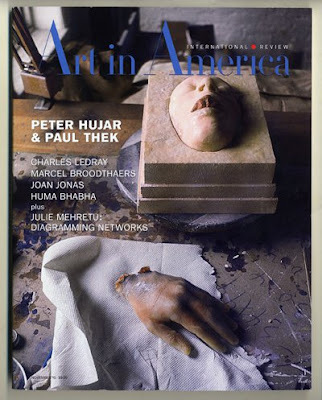 Joseph Hocking and Mark Skwarek were mentioned in the review “”Tunneling” Curated by William Pappenheimer at FAMOUS ACCOUNTANTS” by James Kalm in Art Review. The ability to superimpose additional information on a physical object is one of the most exciting aspects of AR, and one that is utilized to convey a poignant political message by artists Skwarek and Hocking. Although the BP oil scandal has died down considerably since the oil flow in the Gulf has been (finally) put to a stop, it was arguably the largest national disaster we’ve witnessed since Katrina. Still, both the government and the public seemed relatively unphased by the travesty, likely because it didn’t seem to affect them directly. Hocking and Skwarek’s iPhone app art piece hopes to eliminate that sense of distance by confronting the viewer with the realities of that gaping oil hole under the sea every time they see a BP logo, turning the logo into a tube hemorrhaging barrels of oil. The app is an interesting demonstration of how AR can be used to overcome the limitations of the physical world and make seemingly distant objects or information feel more immediate and relevant. We are using the iPhone to create site-specific art work about the BP oil spill. Basically the work lets the viewer see the broken pipe and oil anytime they see a BP logo. 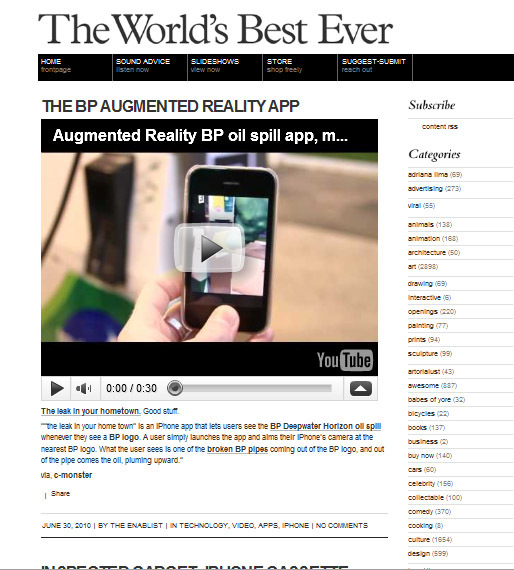 The viewer aims their iPhone at any BP logo and what they will see is the broken oil pipe come out of the BP logo. Out of the broken pipe comes the oil, pluming upward. This is done by overlaying 3D computer graphics onto the iPhone’s video camera, a process also known as augmented reality. What makes this project important is that we are using BP’s corporate logo as a marker to orient the computer-generated 3D graphics, basically turning their own logo against them. This re-purposing of corporate icons will offer future artists and activists a powerful means of expression which will be easily accessible to the masses and at the same time will be safe and nondestructive. No sooner did brand managers and marketers discover augmented reality (AR) as the next big marketing frontier then did consumers find a way to use AR to voice their own opinions. AR developers Mark Skwarek and Joseph Hocking are keeping BP’s feet to the fire with a new AR iPhone app that lets users visualize the Deepwater Horizon oil spill at their local BP gas station or wherever they happen to see a BP logo. Called “the leak in your hometown,” the app transforms the logo into the source of the deep sea gusher. Just point your phone at the logo and your outrage and sense of futility over the unceasing disaster is rekindled. If you’re new to augmented reality, it’s technology that overlay’s digital information and imagery onto your view of real-world things, typically using a webcam or smartphone camera as the visual conduit. An important component of the project is that it uses BP’s corporate logo as a marker, to orient the computer-generated 3D graphics. Basically turning their own logo against them. This repurposing of corporate icons will offer future artists and activists a powerful means of expression which will be easily accessible to the masses and at the same time will be safe and nondestructive. Remember back when brand managers first swooned over the potential of social media as a new direct-to-consumer marketing channel, not yet realizing how the technology gives consumers their own, sometimes critical, voice? With AR, it’s déjà vu all over again. Google ‘augmented reality’ and ‘marketing’ and you’ll see what I mean. But the effusive praise by marketers will soon be tempered as they discover that AR can be a double-edged sword, as much a threat to their companies’ corporate reputation as it is a powerful marketing tool. As the cruel oil rig disaster of BP continues to spill oil all over the bay, beaches and birds, activists and artists start to think of new ways of ad busting and stigmatizing companies, to be seen on the black list sooner and longer. This social hacking raises awareness for the problem and burns the bad management of this biggest environmental accident ever – with Augmented Reality. I have to give a big two thumbs up to the iPhone App, “The Leak in Your Home Town” created by Mark Skwarek and Joesph Hocking. 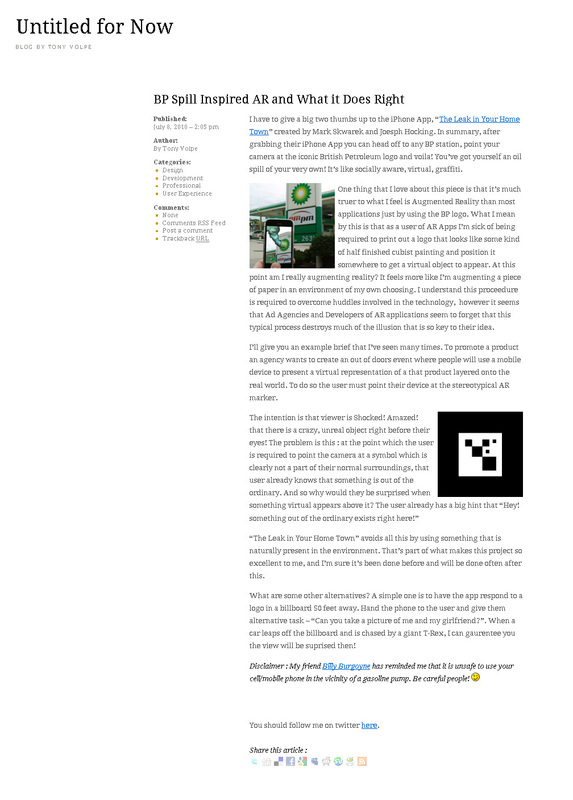 In summary, after grabbing their iPhone App you can head off to any BP station, point your camera at the iconic British Petroleum logo and voila! You’ve got yourself an oil spill of your very own! It’s like socially aware, virtual, graffiti. One thing that I love about this piece is that it’s much truer to what I feel is Augmented Reality than most applications just by using the BP logo. What I mean by this is that as a user of AR Apps I’m sick of being required to print out a logo that looks like some kind of half finished cubist painting and position it somewhere to get a virtual object to appear. At this point am I really augmenting reality? It feels more like I’m augmenting a piece of paper in an environment of my own choosing. I understand this proceedure is required to overcome huddles involved in the technology, however it seems that Ad Agencies and Developers of AR applications seem to forget that this typical process destroys much of the illusion that is so key to their idea. I’ll give you an example brief that I’ve seen many times. To promote a product an agency wants to create an out of doors event where people will use a mobile device to present a virtual representation of a that product layered onto the real world. To do so the user must point their device at the stereotypical AR marker. “The Leak in Your Home Town” avoids all this by using something that is naturally present in the environment. That’s part of what makes this project so excellent to me, and I’m sure it’s been done before and will be done often after this. What are some other alternatives? A simple one is to have the app respond to a logo in a billboard 50 feet away. Hand the phone to the user and give them alternative task – “Can you take a picture of me and my girlfriend?”. When a car leaps off the billboard and is chased by a giant T-Rex, I can gaurentee you the view will be suprised then! So there’s this cheeky new app concept that’s been floating around the Internet lately, and it’s raised the question of how trademarks are protected in the virtual space. “The Leak in Your Hometown,” an augmented reality app for the iPhone that hasn’t yet been approved by Apple, captures any BP logo that the phone’s camera detects, and superimposes an animated pipe, billowing some kind of miasma. Cute, but is it legal? Adbusting like this is a facile form of protest, but the main failure of this app is the fact that it’s both private and self-selecting. 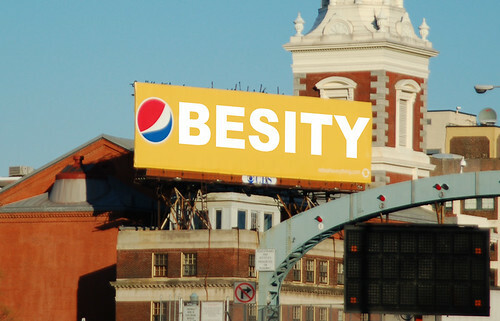 Turning a Pepsi logo, say, into a billboard that reads ‘OBESITY’ is charming, but it also reaches a multitude of viewers who may or may not believe that the soft drink giant contributes to American fattiness. “The Leak in Your Hometown,” in contrast, will only be downloaded and viewed by people who already believe that BP is evil. (Well, that may include all of us nowadays, but you get our point.) 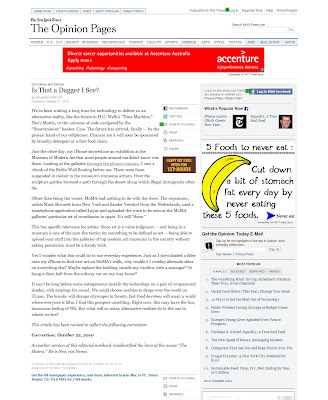 If an ad gets busted, and no one’s around to see it, did it ever really happen? The discussion, though, is all theoretical unless Apple approves the app, which could have its army of attorneys scrambling at yet another lawsuit. Chris Cameron at ReadWriteWeb wonders if this app isn’t a blatant case of trademark infringement, and what precedent an app like this could set for the AR space. While he notes that parody is often protected, he doesn’t really give libel law its due. Unless people mistake a busted BP logo for the real thing, the company has little legal recourse. The real question is whether Apple would approve an app that negatively targets a business, and we’re betting that they won’t. Quando sei responsabile del più grande disastro ambientale del secolo non puoi cavartela facilmente. Ma gli errori di comunicazione commessi da BP sono stati davvero tanti: dall’aver cercato inizialmente di minimizzare l’accaduto fornendo cifre sottostimate del petrolio sversato passando per il tentativo di far ricadere la colpa sul fornitore Transocean Ltd., fino alle dichiarazioni inopportune del suo amministratore delegato. il fake twitter account BPGlobalPR che ha spiazzato tutti con i suoi messaggi al vetriolo e che inizialmente è stato davvero confuso con quello ufficiale BP_America . 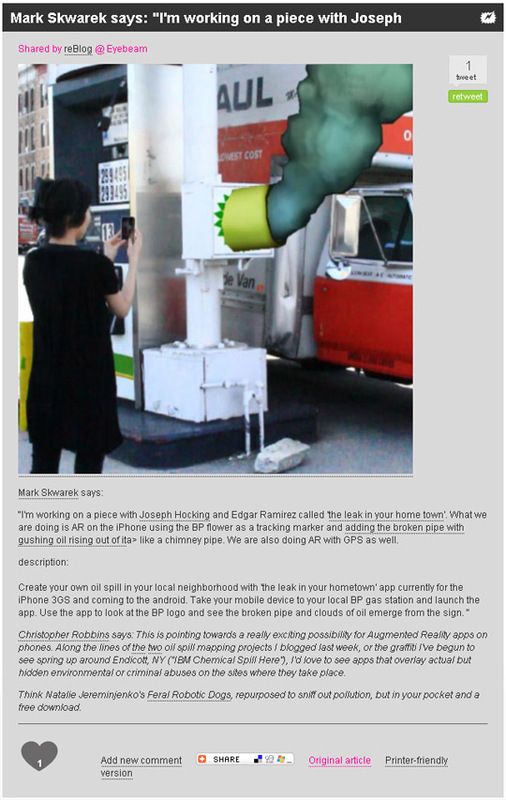 “the leak in your home town” was featured on Eyebeam’s Reblog. bisceglie: the leak in your home town — awesome AR iPhone app. Art and New England magazine, Feature article on Children of Arcadia, in April 2009. "I'm not going to lie - Mark Skwarek's work scares me. His computer-generated interactive scenarios show us what the world will be like if any number of catastrophes occurred. His virtual overlays place one in the thick of grave hypothetical realities, like the 42nd street library in ruins. In another piece, he overlays the New York skyline with that of Baghdad. When smoke rises to the clouds there, we see the grim image in our own skyline. We love his non-virtual installations too, especially an empty, sterile room he created with 400 headphone speakers embedded in to the walls, giving off an eerie hum. He lives in Bushwick, is part of the Rhizome ArtBase, and is RISD MFA 08'." "RISD’s annual “Graduate Thesis Exhibition” could be just the place to glimpse the future of art, as predicted by the school that U.S. News & World Report recently said has the best master of fine arts program in the country." "No trends pop out. This year’s painting and photography are bland, but the show comes through with its usual selection of stylish graphic design and alluringly curious fashion, like Nanhee Kim’s exploded sweater and knit dresses covered with stuff that looks like knit scales or dinosaur fins. But mostly this year’s event is populated by been-there-done-that ideas and styles." "An exception is Mark Skwarek’s Children of Arcadia, which invites you to explore a digital apocalypse. Lightning flashes and rain pours down on rolling green hills dotted with tall trees and ruined classical-type temples. Great plumes of smoke billow into the sky. Blonde women in blue dresses wander about with names hovering above their heads. Occasionally a bit of type pops up on the screen, something about “NYSE” (the New York Stock Exchange). As video game worlds go, it’s good, but nothing much seems to develop. The most interesting thing I found was a group of six virtual ladies rest-lessly walking in a tight circle like furies or fates." "A computer intro explains that this “is a real time virtual ecosystem which undergoes the stress test of the apocalypse to expose the moral fibers of its inhabitants and the flaws in their idealized utopia.” The virtual landscape somehow corresponds to the landscape of New York’s Wall Street. Real people can also supposedly wander New York’s actual financial district wearing special goggles that allow them to virtu-ally wander the apocalyptic arcadia. The severity of the virtual apocalypse is determined by US economic data and Google headline searches for America “good” or “evil.” That’s a lot to take on, and it doesn’t quite add up here, but Skwarek’s onto something." Until the 25th of this month. Cave, at 58 Grand Street, is showing a video installation titled "Intellectual Economy," by Robert Ladislas Derr. Cave is a fascinating venue for contemporary art, as it offers both a main gallery and studio spaces behind, which are part of CAVE AcTS, the gallery's Artists in Residence program. Cave was founded in 1996 and is now one of the longest running experimental art spaces in Williamsburg. Passing on ahead to studio K, one enters Mark Skwarek's "58%", a fantastic mixed-media offering in a small, windowless room, resembling the inside of a cube, with a low ceiling and bright florescent light. The cube's surfaces are entirely covered in what appear to be single-mold casts of a porous plaster skin. The installation is accompanied by a hissing white noise that neutralizes the pounding heard outside. It feels futuristic, and in this context, serves as a purifier, entirely white and clean. One feels transformed by this piece. It is important to note that the steady sound also causes one to question the purpose of the pores; something in their neat regularity makes them indistinct from each other, whereas when, as if by suggestion, one begins to wonder if some gas may indeed be being pumped into this room, each pore becomes more curious and terrible. Like all good science fictions, "58%" is both unfamiliar and miraculous. The rest of the studio spaces are ultimately less effective, largely interesting for their grab-bag feel in comparison to the satisfying, organic nature of the preceding three environments. Studio S houses "Broken Circus." drawings by Mary Doyle, which reads more as an installation that is immature in both subject-matter and accomplishment, while studios N and D show paintings by Naoki Iwakawa and Daisuke Nishimura, respectively.